Bissell Poweredge Pet Hard Floor Stick Vacuum Cleaner is a stick vacuum cleaner ideal for pet owners and hard floors. With a good vacuum for hardwood floors, you could allow your pet to enter any room without worrying about consequences. In a few minutes, everything they leave behind will be gone. Today, we review the best vacuum for pet hair and hardwood floors which promises to get rid of hair and dirt. The Bissell PowerEdge Pet Hard Floor Stick vacuum V-shaped nozzle of the Bissell PowerEdge has many advantages. Not only does it have hair-attracting edges, but you can also tilt it and use it against the furniture edges, or underneath the furniture. It’s easy removing the visible dirt, but your cleaning isn’t successful if you can’t reach all areas of the room. The shape of the nozzle will give you a complete cleaning experience that you’ll be proud of. Nothing is off-limits with Bissell PowerEdge. Not only will you get rid of the particles, but of the bigger debris as well. Thanks to its shape, it’s able to attract all the larger material to the center suction port. Therefore, Bissell PowerEdge Pet Hard Floor vacuum cleaner is an all-in-one device which removes not only pet hair, but all that it encounters on the floor. Being that it is a stick vacuum cleaner, you’ll have complete control of the movement in your hands. With Bissell PowerEdge, you can easily twist and turn the nozzle in the desired direction. Bissell Poweredge Pet Hard Floor Stick Vacuum Cleaner Specifications. Bissell PowerEdge offers a one-year limited warranty. As long as you use it in your home, the warranty covers the malfunctions. However, if you decide to rent the Bissell PowerEdge Pet Hard Floor Stick vacuum cleaner or use it for commercial purpose, the warranty won’t be valid. Futhermore, the warranty does not cover maintenance components such as filters and brushes. Although certifications are reliable indicators of quality, let not the lack of them intimidate you. Bissell PowerEdge has no particular certifications, but it’s definitely not a decisive factor. Bissell PowerEdge Pet Hard Floor Stick Vacuum 81L2A is a stick vacuum cleaner which can capture both large debris and fine particles such as pet hairs. Its design is perfect for cleaning after pets since it has hair-attracting materials along the edges. Therefore, the hair-attracting part is a guarantee more for the removal of pet hair. 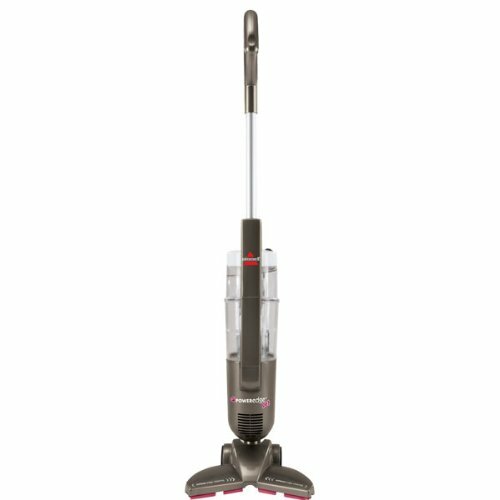 Also, the V-shaped wipers of the Bissell PowerEdge Pet Hard Floor Stick vacuum cleaner are designed to force the larger debris to the center suction path. This ensures that your hard floors will be absolutely clean. Another advantage of the V-shaped base of Bissell PowerEdge is that it can go around the edges of your furniture. It fits in tight places, moves easily and can get the unwanted particles everywhere. Not only is Bissell PowerEdge Pet Hard Floor Stick Vacuum efficient when it comes to pet hair. It is also a good vacuum for hardwood floors in general. If you can do all of your cleaning with only one device, why would you miss it? Imagine using a single device on your hard floors and not having to worry about a single particle of dirt getting away. You can use this stick vacuum anywhere around the house, underneath your furniture, or along the edges. As long as you have a reliable ally such as PowerEdge vacuum, you will be able to relax. In just a couple of minutes you’ll get rid of the hair and the dirt, without having to use any other devices. 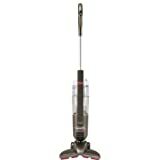 Have you had any experience with Bissell PowerEdge Pet Hard Floor Stick Vacuum? Do you need to use anything else to help you clean after your loyal friend? What do you rely on when cleaning? Feel free to share your experience in the comment section below.